Ukulele player, blogger at Got A Ukulele and the author of the "What Ukulele Players Really Want To Know" series of owners manuals for new players. 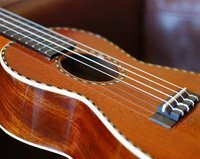 The second appearance for the Mr Mai brand on Got A Ukulele this week, but this time we move to the top of the line with their M-M80 Solid Koa Concert Uke. We’d love your help. Let us know what’s wrong with this preview of The Complete What Ukulele Players Really Want To Know by Barry Maz. We’d love your help. Let us know what’s wrong with this preview of A Wild Sheep Chase by Haruki Murakami.
" I know Jon, and thought the book had one. It does via Kindle, and thought I had one on other versions. Could be my mistake, and apologies. Always good I know Jon, and thought the book had one. It does via Kindle, and thought I had one on other versions. Could be my mistake, and apologies. Always good to hear from a uke player though - what do you play? ...more "
"Loved the music theory chapters; most books focus on voice or piano, so it was nice to see how ukulele chords work. The only thing the book was missing was a table of contents." Barry Maz liked Barry Maz's blog post: For those new ukers! We’d love your help. Let us know what’s wrong with this preview of RUNNING IN CORRIDORS by C.H. Edwards. We’d love your help. Let us know what’s wrong with this preview of The Wind-Up Bird Chronicle by Haruki Murakami.